One of the major criteria in evaluating the excellence of martial artists is their form, i.e., the structure of their basic fundamentals, techniques, kicks, punches, hand strikes, movement, etc. If their form is faulty, so will be their art. If their form is perfect, so will their art be also. Throughout the history of the Karate Institute of America, the form of our competitors has been responsible for literally hundreds of championships in all areas of martial arts competition on a local, state, regional and national level. 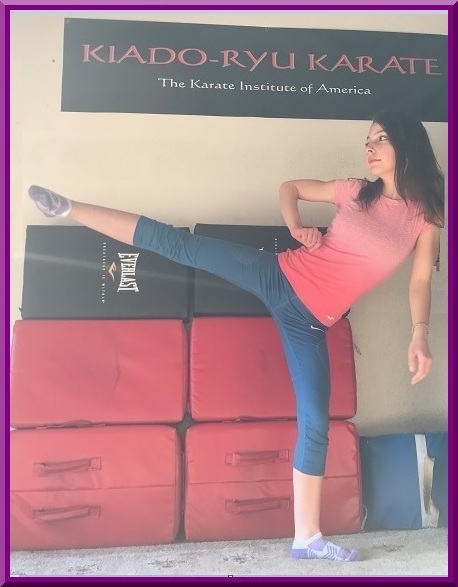 Pictured below is nineteen year old Hannah S. Her current rank is Blue Belt. Just take a look at her beautiful form as she executes a right knife edge kick with exquisite balance. Perfect form is what all competent martial artists exude. And just think of how much work it takes to be perfect. A bunch, and Hannah is as determined as any student we’ve ever had at the KIA to be excellent at her art. Bravo, Hannibal! Keep up the inspirational work! We all benefit when you succeed because you help maintain the very high bar that is the legacy of the Karate Institute of America in its 39+ years of existence.